Hello, Great Readers of our series! Just in case you haven’t visited before, let me tell you a little about A Great Nephew & A Great Aunt. My great nephew, Landon (a fifth-grader) and I (his great aunt) collaborate. I write a poem which he illustrates. We started this collaboration last fall and have had so much fun with it that we decided to invite others along. Landon and I will continue to have a new episode on the second Friday of each month. The other Fridays are filling up quickly with guests. I have created a page on my website to view all the episodes of A Great Nephew & A Great Aunt. Click HERE to visit the page and enjoy past episodes. Today I’m thrilled to welcome . . .
Catherine Johnson and 6 year old daughter, Hannah! When I asked Catherine to join me today, she jumped right on board by looking through Hannah’s stash of paintings for inspiration. I know you’ll enjoy Catherine’s sense of humor as much as I do. 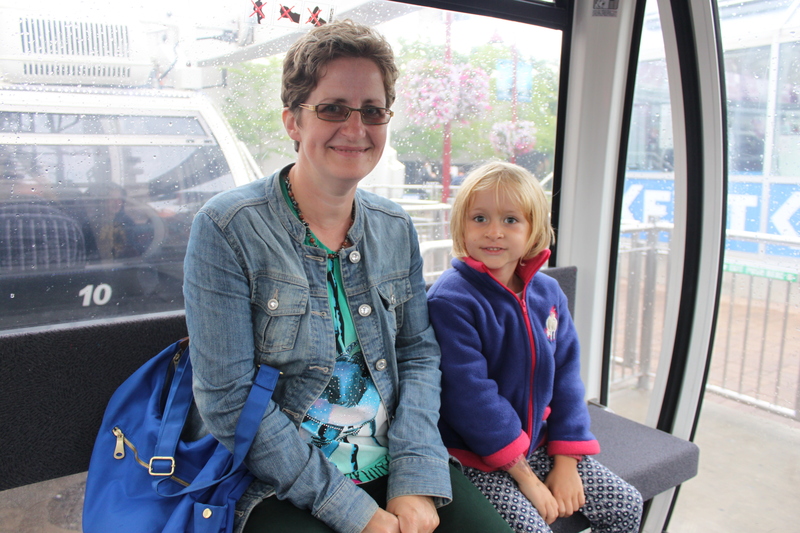 Catherine and Hannah having fun in a Niagara Skywheel. Meet Catherine and Hannah: Catherine Johnson is a British Ex-Pat who loves Formula One, The Voice, dog walks and being silly. She also loves writing poems for kids and now can’t stop doodling and painting, too. Catherine is the author/illustrator of Weirdo Zoo, The Everglades, and Zompoemz. She blogs about poems and art on her blog HERE. Hannah is six, and a budding artist. Thanks to Robyn Campbell for hosting the Poetry Friday Roundup this week. 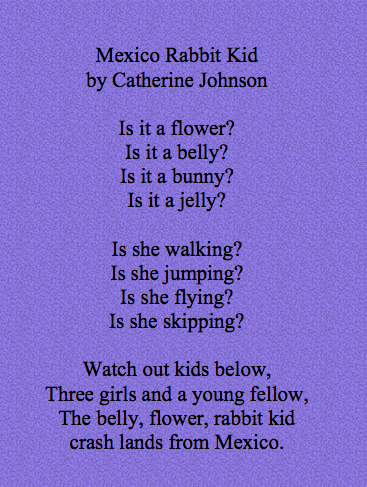 This entry was posted in A Great Nephew & A Great Aunt, Poems and tagged A GREAT Nephew & A GREAT Aunt, Catherine Johnson, poetry, Poetry Friday. Bookmark the permalink. You picked the perfect guest combo, Penny! Luverly! I love the poem and the art Catherine and Hannah! Thanks for coming by, Stacy! I love it that you are sharing other collaborators! I’m loving it, too, Mary Lee. So much fun! Thanks so much for having Hannah and I today, Penny. It was fun! Thanks so much for being my guests! It was fun! This is such a fun combination of child art and child heart. Thanks, Margaret! I have to remind myself to think like a kid. That’s a perfect way to put it Margaret.Thanks for coming by! What a fun poem/art combo! I love both of your uses of imagination in working together. Tell Hannah her artwork is wonderful! Like what you’re doing Penny. Glad you enjoyed it, Michelle. Thanks for dropping in, Michelle. There’s lots of whimsy to be found here! Isn’t that photo the best? Thank you for coming by to join in the fun today. Good idea, Robyn. She can barely write but I could encourage her to write one. Fun! Adorable! Hug that artist tight, Catherine! Thanks for dropping by, Carrie! Hugs are the perfect reward for such collaboration. Great job Catherine and Hannah! Didn’t they do a great job? Thanks for coming by on this Poetry Friday, Jama. What a team Catherine and Hannah make! 🙂 I can tell they always have fun together. They make a great team. And I ‘ve noticed how much fun they have by visiting Catherine’s blog. I love how she includes her kids in some of her posts. She says she doesn’t like school so if we can have fun at home that makes up for it.. So funny, Hannah says it’s just long hair. Thanks for coming by to view Catherine and Hannah’s collaboration, Tracy! The poem AND especially the art made me smile, Catherine and Hannah. LOVE. Love your photo too. Beautiful! Catherine’s poems always make me smile and Hannah’s art is a wonderful way to be inspired. You’re so right, Mona. Normal picture prompts make for normal poems. 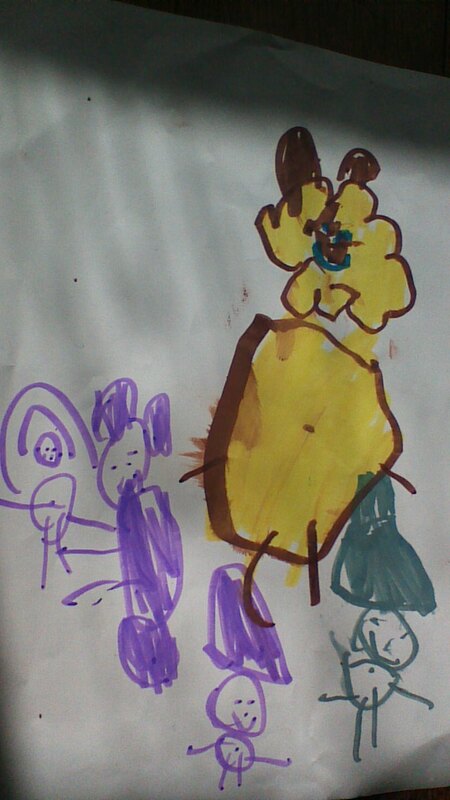 I even asked at school if I could take pictures of the kids’ artwork but alas no. I think you’d have to ask each child’s permission or something. Too bad. Catherine, you may not be able to take pictures of their work but it would be such a fun project for the kids at school…to sit in the hall and come up with a couplet based on another student’s art!!! Oh yes! I might suggest that. Great artwork and creativity! BTW – I think it’s a belly. Plus I hope Mom rubs my belly soon. I think you’re right, Cupcake. No mistaking that belly button. I hope you get your belly rub! Of course your thoughts are on bellies and belly-rubbing, Cupcake! Thanks for the love and licks! Always fun. Penny. Love the free spiritness of a child – Hannah. She makes it easy for her mom to write silly and fun! There’s a writing exercise we can all use!!!! Thanks girls. I love children’s artwork, too! And, you’re right about their art making for a good writing exercise.